This was a GREAT learning experience! The course was laid out so excellent for all types of learning…definitely not boring at all! Great hands-on learning; it really gave you the tools needed to succeed and definitely made a lasting impression on me. I’ve been using a “plotter” for six months (due to an arm injury) and through this course I was taught techniques to better my skills leaving all of my expensive tools and plotters to collect dust when I return. Best investment I ever made towards my future…anyone want to buy a plotter for cheap, lol, then SHOW ME? The things I learned in the class simply blew me away! I’m so inspired to go back to Iowa and turn what I’ve learned here into success! 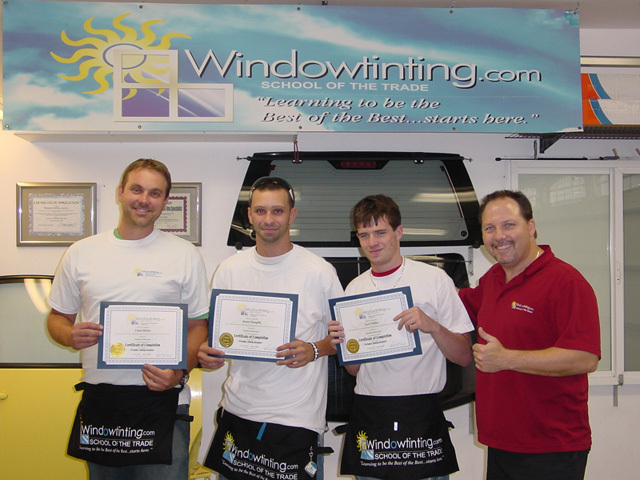 If asked, I’d be proud to recommend people to this school and proud to say I learned all my skills for window tinting right here! I appreciated the training I received very much!